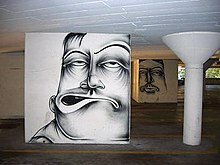 Barry McGee (born 1966 in San Francisco) is a contemporary US artist, painter, and graffiti artist (Twist). He is also known by monikers such as Ray Fong, Bernon Vernon, and P.Kin. He was married to the artist Margaret Kilgallen, who died of cancer in 2001. They have a daughter named Asha. Barry McGee has had numerous shows, both solo and group, in galleries internationally. McGee was a central figure in the graffiti art scene in San Francisco from the late 80's and into the 90's. As Twist, he became well known nationally by his stylized black and white pictographic flathead screw graffiti 'throw ups'. 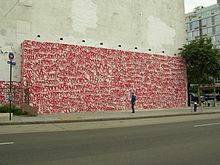 Later he was part of the Mission School art movement based in the aesthetics of the Mission District of San Francisco. His work is founded on a pessimistic view of the urban experience, which he describes as, "urban ills, over-stimulations, frustrations, addictions & trying to maintain a level head under the constant bombardment of advertising". He was also an artist in residence at inner-city McClymonds High School in Oakland, California in the early '90s. Although his artistic origins lie in New York subway graffiti he has been included as a member of the street art movement. McGee's installations consist of simple bold paintings which are influenced by Islamic patterns on tiles, vernacular sign painting, or use caricatures of the destitute. These paintings are clustered together in combination with photographs of other graffiti writers. Older work included layering of shapes, and buff marks, backgrounds of drips painted directly on the gallery wall. He has painted stylized portraits on empty bottles of liquor, flattened spray cans, and wrecked vehicles for art shows. He has collaborated frequently with Amaze, allowing him to paint the exterior and interior of the galleries exhibiting McGee's work. They have also utilized realistic moving mechanical human figures that appear to be tagging gallery walls. McGee continues to be highly influential on the urban art scene. In 2004, as part of an exhibit, McGee spray-painted "Smash the State" on the walls of San Francisco Supervisor Matt Gonzalez's City Hall office (City Hall is a registered national landmark)." Gonzalez told the press that he knew his office would be repainted for the next occupant. McGee was involved in a controversy regarding the Adidas Y1 HUF, a shoe for which he provided the artwork. This gave rise to a protest campaign by some Asian-Americans who claimed that the picture on the shoe's tongue depicts a racist stereotype. McGee responded to the controversy in a March 2006 press release. He stated that the drawing was a portrait of himself as an 8-year-old child. Barry McGee is half Chinese. Included in the 2001 Venice Biennale. Rose Art Museum in Waltham, MA. Apr 29 – Jul 25, 2004. Featured in Beautiful Losers exhibition at Circleculture Gallery in Berlin, Germany. February 13 – March 6, 2006. LOFT installation at Roberts & Tilton Gallery Los Angeles, CA. Dec.2, 2006 – Feb 3, 2007. Watari-um Museum in Tokyo, Japan Jun 2 -Sept 30, 2007. BALTIC Centre in UK. January 21 – April 27, 2008. With Clare Rojas in The Big Sad at Riverside Art Museum, Riverside, CA. Mar 30 – May 17, 2008. Ratio 3 in San Francisco, CA. September 5 – October 18, 2008. McGee / Templeton / Pettibon exhibition curated by Aaron Rose at Circleculture Gallery in Berlin, Germany. April 9 – May 30, 2009. With HuskMitNavn The Last Night, at A.L.I.C.E. gallery in Brussels, Belgium. March 25 – April 28, 2010. ^ Lelchuk, I. Lelchuk, Ilene (December 10, 2004). "Last word on government: Graffiti installation in Gonzalez's office gets mixed reviews". The San Francisco Chronicle. Retrieved May 10, 2006. San Francisco Chronicle on the web, December 10, 2004. ^ "Deitch". September 20, 2007. Archived from the original on September 20, 2007. Retrieved January 20, 2019. ^ "Installations". Rice Gallery. Retrieved January 20, 2019. ^ "Barry McGee, Gallery Paule Anglim, San Francisco". January 5, 2007. Archived from the original on January 5, 2007. Retrieved January 20, 2019. ^ "BrandeisNOW". Brandeis.edu. Retrieved January 20, 2019. ^ "Circle Culture Gallery". Archive.is. November 30, 2013. Archived from the original on November 30, 2013. Retrieved January 20, 2019. ^ "Roberts Projects". Robertsprojectsla.com. Retrieved January 20, 2019. ^ "watari-um - exhibition - バリー・マッギー展". Watarium.co.jp. Retrieved January 20, 2019. ^ "BALTIC Centre for Contemporary Art". March 31, 2008. Archived from the original on March 31, 2008. Retrieved January 20, 2019. ^ "Riverside Art Museum - Exhibitions - The Big Sad: Barry McGee & Clare Rojas". October 19, 2008. Archived from the original on October 19, 2008. Retrieved January 20, 2019. ^ "Barry McGee - Signals". April 29, 2008. Archived from the original on April 29, 2008. Retrieved January 20, 2019. ^ "Biennale de Lyon 2009 - Pictures gallery". October 30, 2009. Archived from the original on October 30, 2009. Retrieved January 20, 2019. ^ "BAM/PFA - Art Exhibitions - Barry McGee". November 15, 2012. Archived from the original on November 15, 2012. Retrieved January 20, 2019.